The autograph of Pete Townshend from 1965, with the autograph of Phil Everley of the Everley Brothers on the reverse. 220 Cube: 7" Singles record box. Old favorites & exciting new designs all great quality solid wooden crates in 12" & 7" sizes. Super stylish storage solution for your record collection. Flat sides & solid base panel to keep your vinyl straight and warp free. This is printed onto A3 size 260gm heavyweight glossy photo paper. The colours are sharp and vibrant. The Who Quadrophenia Live In London - Metal Box - Deluxe Edition. Condition is Like New. Not sealed but contents never played so remains in fabulous condition. 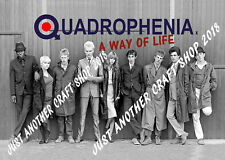 Consists of x2 DVDs (blu-Ray) of complete Quadrophenia performance in London. Also x2 audio CDs of same performance and an additional CD featuring the original Quadrophenia album. In addition to this, there is also a glossy picture book included and a mod symbol badge. All housed in a padded metal circular tin with the mod logo on the front. Finished off in transparent plastic outer case. RRP for around £80-£100 depending on where you look. Starting low with no reserve. Dispatched with Royal Mail tracked service. I think was from Wembley early 90’s. 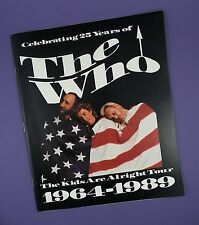 The Who Poster. Condition is Acceptable. Dispatched with Royal Mail 1st Class. A set of 81 Quality 25mm button badges featuring The Who 1964-69 era. Badges are NEW and mint condition. Quality Components - British Manufacturers have been used in the production of Outlaw's button badges for 12 years. 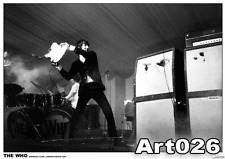 An original unpublished photo of the Who playing live in London, from 1965. THE WHO - 'BY NUMBERS'- SUPERB 11oz COLLECTORS MUG. STRICTLY LIMITED QUANTITY. Original flyer for their 'Last Orders' 50th Anniversary Tour @ Hull City Hall April 2nd 2019. 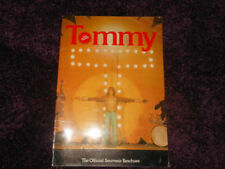 Great item for any fan or collector. RARE FULL BAND SIGNATURES. AUTOGRAPHED PHOTOGRAPH. DIRECT FROM THE UK. YOU TO OWN THIS UNIQUE RARE COLLECTORS ITEM AT A. THE ULTIMATE HISTORICAL ROCK COLLECTABLE. Presented image on disc. The background image consists of a record player. A Rhinestone has been placed into the middle of the customised Record label for added flare! Roger Water Stage Pass Live At The Marquee June-July 2006. Condition is Like New. Dispatched with Royal Mail 1st Class Large Letter. The Ultimate in Scooter Spares, Parts & Accessories. Our passion for scooters exceeds expectation - we’re not just a dealer, we’re scooter fanatics. THE WHO 'ANYWAY, ANYHOW, ANYWHERE. THIS IS A ROUND 100MM STICKER 4". HIGH QUALITY MATT VINYL STICKER WATERPROOF. WOULD LOOK GREAT ANYWHERE SCOOTER LAPTOP GUITAR OR CASE SPEAKERS ETC. JUST PEEL OF BACKING AND STICK TO ANY CLEAN DRY SURFACE. Book has crease in bottom corner (see picture). 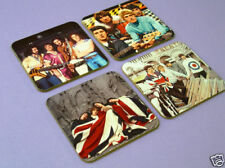 100% acrylic - hand wash. An ideal gift for the Who fan who has (almost) everything. Beyond this an "Unpaid Item Dispute" may be opened. The Who green/blue stripe short sleeve shirt Medium has "The Who" and Logo on top and bottom buttons and on stitched label at bottom of shirt. Shirt also has "The Who" and picture label dated 2009 inside at neck. The Who VIP lanyards from Uk Tours in very good condition. 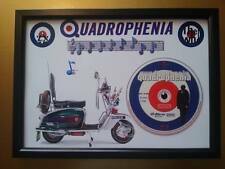 Quadrophenia and The Who hits 50. 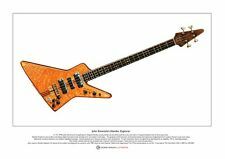 This is a rare numbered print - number 829 of only 1000 made. Vespa Servizo. 220 Cube: 7" Singles record box. 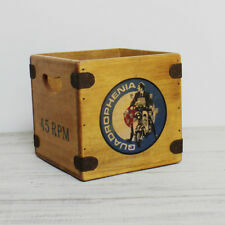 Old favorites & exciting new designs all great quality solid wooden crates in 12" & 7" sizes. Super stylish storage solution for your record collection. Also included are 4 passes for the event. Two are VIP passes for each date of the performance, one is an ‘All Access’ pass and the other an ‘Artist’ pass. The condition is very good plus. A plus or minus after the grading indicates that the condition is marginally higher or lower than the stated grade. Armando Curcio Editore. Monterey~New York~Amsterdam. CD LIVE 1967-1970. EX Condition. By Pete Townsend. Pictorial, editorial, lyrics and songbook. Introduction & Notes On The Songs. A History In Music & Photographs. On the whole very good used condition. Photographed from all angles ONLY as a visual aid to assist with condition of used item, all rights remain with publisher. As well asThe Who the shows featured guestsBilly Idol ,Steve Winwood ,Patti Labelle andPhil Collins. clean condition. A rare black XL large T Shirt promotingThe Who 's 2004 release 'Real Good Looking Boy'. This T Shirt was sold throughPete Townshend's Eelpie website for the Double O Charity (whose logo is on the back). We do not use board backed paper envelopes. It’s is overall good condition and has been folded down and has a small tear in one of the crevices. The Who "My Generation - Anyway, Anyhow, Anywhere" T Shirt. "Redwood" Label Says "XL". Pit To Pit 23" - 24" Approx, Total Length 30" - 31" Approx. Extra Large. 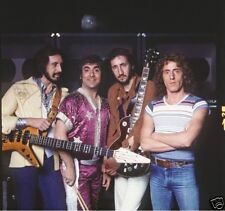 The band crystallised around Townshend as the primary songwriter and creative force (though Entwistle would also make notable songwriting contributions). Townshend was at the centre of the band's tensions, as he strove to write challenging and thoughtful music, while Daltrey preferred energetic and macho material (Daltrey would occasionally refuse to sing a Townshend composition and Townshend would thus sing it himself). The Who Mod Target the Kids Are Alright Sticker 4"
The Who Logo Chrome Sticker 4.5"x4.5"
The Who Band Sticker 3.25"x5"
*Very Rare * THE WHO Black And White Comic ~ Must See !! Vintage 1982 Pete Townshend The Who Promotional Record Store Poster 20" x 27"
1980S THE WHO, 15 YEARS, CARNIVAL PRIZE PAINTED GLASS HANGING FRAME, 8" X 10"